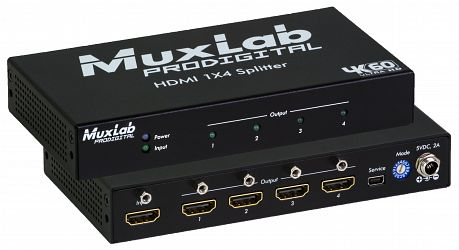 Muxlab 500426 är en HDMI 2.0 splitter med 1 ingång och 4 utgångar som bland annat stödjer [email protected] (3840x2160) (4:4:4) och HDR.
? ?The HDMI 1×4 Splitter, 4K60 (500426) allows one (1) HDMI 2.0 source to be distributed to up to four (4) HDMI displays. The splitter supports up to 4K (3840 X 2160) video @ 60Hz, HDR, Deep Color and HD audio. The splitter is HDCP 1.4 & 2.2 compliant and features LED diagnostics. Additionally, all connectors are on the rear panel for neater cabling.